Both the ketogenic–low carbohydrate diet–and intermittent fasting have been shown to balance glucose levels in the bloodstream, improve insulin sensitivity, quell food cravings and make workouts more effective. All of these are essential if your goal is to achieve sustainable weight loss and an overall healthier lifestyle. Due to its popularity, many people have tried the keto diet. This type of diet severely restricts carbohydrates so that your body is forced to burn stored fat for energy. The keto diet alone certainly speeds weight loss and helps you control cravings. However, when combined with intermittent fasting, numerous individuals are able to lose weight at an even faster rate. Intermittent fasting does not call for the restriction of calories. Rather, it merely limits your eating window to a specific period of time. For example, you typically fast anywhere from 15-24 hours. When this period of time has elapsed, your “eating window” begins, during which you consume any amount of low or zero carbohydrate foods you prefer. However, the goal is to eat to satiety, as opposed to overeating. Fortunately, when following a low carb diet, overeating is usually not an issue, as cravings are generally well controlled when carbs are shunned in lieu of healthy fats and proteins. Low carb diets are designed to force your body to burn stored fat as its primary source of fuel. With a typical diet, carbohydrates are burned first, followed by protein, and then fat as the final source of fuel. However, because most people consume far more carbohydrates than are necessary, the excess calories are stored as fat and weight loss is difficult to achieve. When your body begins burning stored fat as its primary fuel source, this state is called ketosis, hence the diet’s name. If you begin intermittent fasting when you are already restricting carbohydrates, your body reaches ketosis at a quicker rate. Therefore, adding the fasting window helps you with the initial phase of your diet, which is usually the most difficult for anyone. Stable blood sugar levels are vital to the success of any diet. This is because when glucose levels plummet, it leads to intense hunger, which almost always results in binge eating. Stable blood sugar levels help eliminate headaches, lack of focus, poor memory, and brain fog as well. Interestingly, these are common complaints among those who follow high carbohydrate diets, as opposed to diets that are rich in fat and protein. In one study, protein and carbohydrates were more efficiently absorbed in individuals who completed a cardio workout after fasting, as opposed to those who consumed a carbohydrate rich breakfast prior to working out. This research indicates that fasting can assist your body to more efficiently absorb nutrients from your post-exercise meals, as well as improve your general health and boost lean muscle mass growth. The ketogenic eating plan has long been a favorite among dieters who struggle with weight loss plateaus, and there are various reasons why this is the case. For example, on a low-carb diet you are obviously burning fat as your main source of fuel. However, your metabolism must work harder to process fat than carbohydrates. Therefore, your metabolism is essentially “tricked” into working at a faster rate when carbs are limited. In addition, combining intermittent fasting and the keto diet creates a very small time frame for eating. This lets your body use your current meal as fuel, rather than storing any of your calories as fat. The primary reason for the failure of virtually any diet is the fact that you simply become too hungry and feel too deprived to continue following the meal plan. If you are like most people, you have probably tried overpriced diet programs, during which you are expected to get through an afternoon of work on a few tablespoons of pasta and a small protein shake. Naturally, a few hours after lunch you are “starving,” and probably head to the snack machine for something to get you through until supper. Fortunately, satisfaction is not an issue on the keto-intermittent fasting diet, as weight loss is accomplished without you ever feeling deprived or famished. This is because a diet high in healthy fats is much more satisfying than a diet high in sugar, flour, and other types of starch. This is why unnecessary snacking and the intake of extra calories is almost never a problem when you follow the keto diet with intermittent fasting. Both the keto diet and intermittent fasting trigger something referred to as autophagy. The latter is simply the technical term for a natural bodily function called “self-eating.” Although at first this may sound a bit frightening, autophagy is merely your body’s normal detoxification process, during which it eliminates contaminants and replaces them with newly formed, healthy cells. Autophagy always occurs during fasting periods or when your carbohydrate intake is low. This process is accelerated when you combine both methods, and in certain cases may lower your risk for type II diabetes and heart disease. Ketosis and fasting are healthy for the human brain. When the ketogenic diet is followed, sometime within the first 30 days your body stops depending on glucose. This is because it is using stored fat for energy instead, and this state of ketosis is associated with enhanced mental clarity. For this reason, certain experts believe that intermittent fasting improves a broad range of neuro-degenerative conditions, including stroke, Huntington’s disease, Parkinson’s disease, and Alzheimer’s disease. After conducting a study on animals, researchers at the National Institute on Aging, found that cyclical fasting helps neurons in the brain to resist degeneration and dysfunction. There is no right or wrong intermittent fasting method. Rather, you must simply try several different options until you find a fasting window that works for you. As a general rule, you should fast for at least 12 hours, but no longer than 36 hours at a time. At the beginning of your diet, it is important to avoid forcing yourself into a long fast. Your body must get used to skipping meals or fasting long periods of time between meals. The best way to acclimate your body to this pattern is to occasionally skip a meal. However, the “eat like a king for breakfast, a prince for lunch, and a pauper for supper” often only works on paper: the average person feels hungrier throughout the day, as he or she is in need of more energy–and subsequently more calories–to feel energized. It is essentially a myth that eating at night causes you to gain weight, and therefore having the bulk of your calories early in the day is important. This theory is easily dispelled when you think about the fact that your body needs a specific number of calories to function in any 24-hour period. The time frame during which those calories are consumed does not matter, provided you are not overeating during that 24-hour period. After adapting to intermittent fasting and the keto diet, most dieters simply eat when they are hungry. This is because fat and protein lead to strong satiety, unlike carbs that do the opposite and cause cravings. You may choose to simply fast for 20 hours each day and consume your calories during a four-hour window and follow this pattern until your weight loss goals are achieved. You may also decide to change your patterns regularly, such as alternating an 18 hour fast and a six hour eating window with a 36 hour fast and a 12 hour eating window. The easiest way to decide which fasting-eating pattern works best for you is to go by how you feel. Pay close attention to your energy levels, sleep quality, cognitive function, hunger levels, and work performance. You may find that giving yourself an occasional day to indulge in carbs helps enhance your results as well. Because all people are different, it may take trying several approaches before finding the one that best suits your needs. Many people achieve the best results by starting the ketogenic diet first and then beginning intermittent fasting several weeks later. 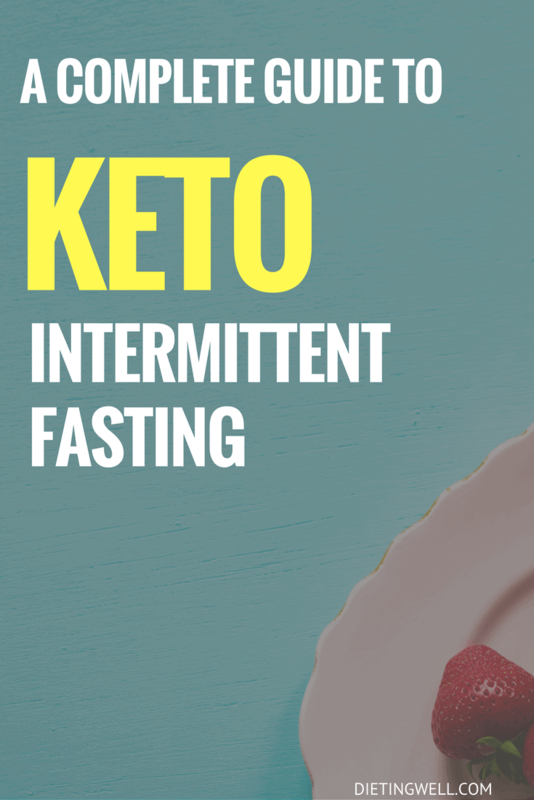 Although this is a bit different from the classic approach to the keto-intermittent fasting diet, it works better for some individuals. This is because intermittent fasting, as previously mentioned, should be a natural process, during which you should not feel deprived and hungry. For example, you may be involved in a complicated project at work, completing a long day of shopping and errands, or overseeing an important project at home and discovered that you forgot all about food. Let these natural occurrences work for you rather than against you when beginning the keto-intermittent fasting diet. Regardless of the approach you take to your new diet, make sure you drink adequate amounts of water. Although coffee and tea are perfectly acceptable on this diet, particularly during fasting periods, it is also important to drink the standard eight to ten, 8-ounce glasses of water per day. A new fad for low-carb diets is something called “bulletproof coffee” first thing in the morning. This beverage is tasty and easy to make, as you simply add melted butter or coconut oil to your coffee, which quells hunger pangs. However, it is not a good idea if you are doing an intermittent fast. This is because any food or beverage with calories breaks your fast. Nevertheless, it is perfectly fine to consume bulletproof coffee during your eating window. As with any diet, certain individuals are not good candidates for the keto-intermittent fasting diet. If you are pregnant or nursing, have a sleep disorder, a history of bulimia or anorexia, or if you suffer from type I diabetes, you should avoid this type of diet program. However, Type II diabetics can successfully follow this diet, but should only do so under the supervision of a licensed, health care practitioner. Additionally, if you experience irregular menstrual cycles, hormone imbalances, anxiety, sleeplessness, constant headaches or other disruptive side effects, you should discontinue the diet. Ultimately, the ketogenic diet, when combined with intermittent fasting, can speed weight loss, quell cravings, help you absorb nutrients, eliminate toxic substances from your body, and stabilize sugar levels. Do not be concerned if you have to experiment a bit to find the perfect fasting versus eating schedule. Once you achieve this, the diet should be easy to follow without feeling deprived or experiencing hunger cravings. As always, speak to a doctor before starting any new diet or exercise program.